As the heat of summer starts to roll in, and as we spend more and more days out and about, and less of them in our apartment, my stroller basket keeps getting more use. Between parks, meetings, and various play dates uptown and downtown, things happen. Really, anything can happen! Our stroller basket stays stocked with the things we need for it all, and it always makes me feel pretty fantastic in the mom department. There’s just something to be said about navigating the city in an organized and prepared manner. 1. An extra swimsuit. So, the sprinklers are on! In New York City language, that means legitimate warm weather! Some days we have zero plans to run through water, but we always end up in it somehow. The life of a toddler, it’s pretty magical and unexpected. This reminds me of River. 2. When mama’s kisses are not enough, this works for all the boo boos. Also, the cutest band aids. 3. We purchased this hat for Oak last summer when he was a little bean. I love that it folds super duper small, and he can’t untie it. 4. Swaddle blankets to shade the sleeping baby from the sun. These have the cutest sayings! 5. Perfect for keeping little tootsies warm when we are out all day and night, and the temperature begins to drop. 6. Hands down, the best mineral based sunscreen. 7. For bringing home groceries and other random things found and purchased during our excursions. 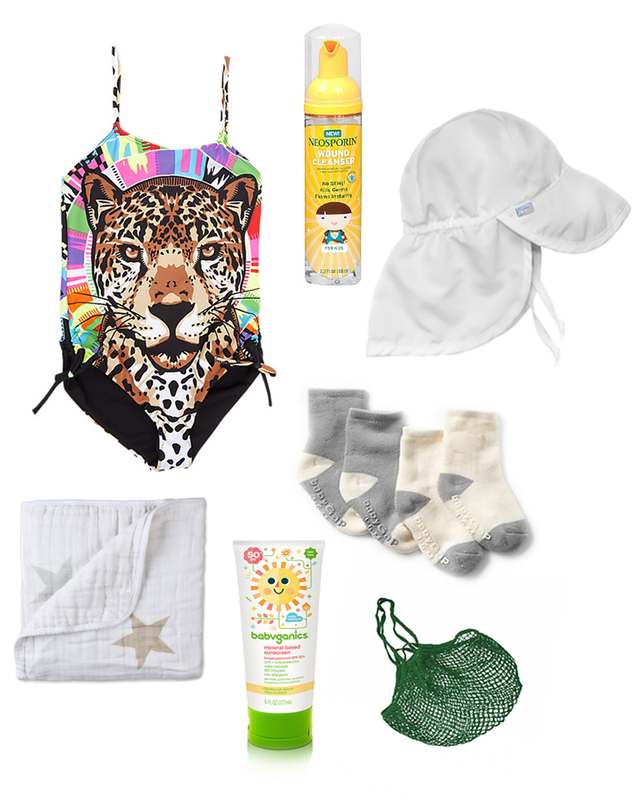 What is something you must have in your stroller basket for you kids this summer? Sounds like what's in my purse/diaper bag. Love the swaddle from Coveted and I must have it. When I went into labor with my 2nd, I sent a text to my husband that read "Sh*t's gettin' real" – haha!